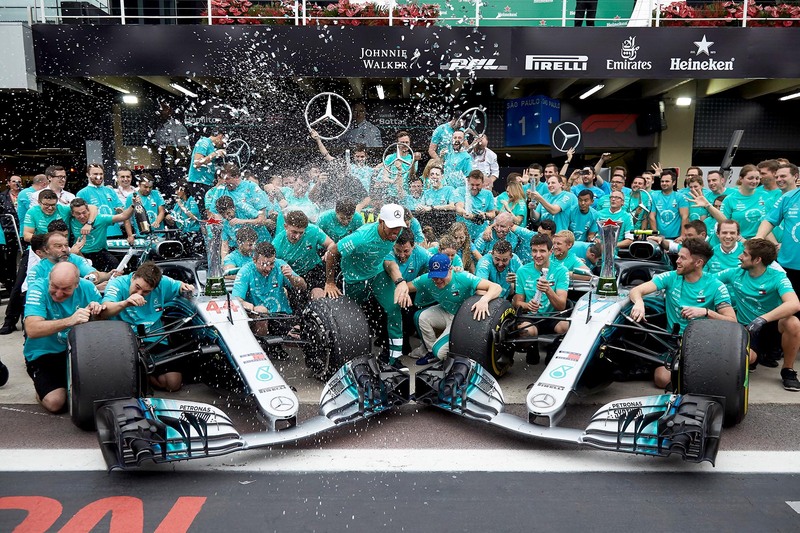 It’s tempting to let Mercedes’s fifth consecutive constructors championship victory at the weekend’s Brazilian Grand Prix slip under the radar as a post-script to Lewis Hamilton’s triumph two weeks earlier, but it would be wrong to assume the feat is less deserving of acclaim. Though the sport’s individual honour is the better publicised of Formula One’s two titles, hundreds of men and women in each team are working as hard as their drivers out of the limelight, and for those in the employ of the famous German marque, Sunday’s constructors championship victory is recognition of their raising of the benchmark yet again. Hamilton and Bottas’s win and fifth-place finishes respectively in Sao Paulo put the Silver Arrows on the precipice of history. Mercedes has now usurped Red Bull Racing as the most successful team of the post-Ferrari-Schumacher era and has elevated itself to outright second in terms of successive titles won, behind only Ferrari’s 1999–2004 streak. But more important than the feat itself and the fact it was achieved by beating Ferrari, the historic benchmark, is how Mercedes was able to win its fifth on the trot, because despite it wrapping up the title with time to spare, 2018 was no walk in the park. Ferrari pushed Mercedes harder than any team has so far managed, from starting with a quietly confident preseason, to strong victories on traditional Silver Arrows circuits like Spa-Francorchamps and Silverstone. Indeed there points in the season when the fatal cracking of Mercedes’s hold on Formula One looked a mere formality. A string of five midyear races from Austria to Belgium demonstrated Ferrari’s car was vulnerable to the Mercedes only in wet conditions and that it held a decisive pace advantage in all other areas, even if the points swung away from the Scuderia thanks to a series of mitigating errors. But ironically it was the last of those races — Hamilton’s defeat from pole position by Sebastian Vettel in Belgium — that proved decisive in Mercedes swinging momentum back in its favour. “I sent an email I sent after Spa where we said we are just not giving up, because this is not a championship we are going to lose,” Wolff said after Hamilton won the Japanese Grand Prix. “We need to understand why we have been outperformed. That sort of dogged focus illustrates why Mercedes is such a formidable threat to Formula One’s records, and it wasn’t the first nor the last time it executed a sudden, emphatic turnaround — it famously committed 10 days of 24/7 work after its humiliating defeat at last year’s Monaco Grand Prix to set up a strong victory for Lewis Hamilton just one round later in Canada, for example. And it’s therefore fitting that Mercedes was able to seal the constructors championship in Brazil after recovering from two difficult grands prix in North America, where unusually severe tyre wear left it defenceless against both Ferrari and even Red Bull Racing. The secret, put simply, is teamwork. “There was the famous terrible plan tragedy in Poland where the place with the Polish president crashed,” Wolff analogised. “They aborted two landing attempts because the fog was too thick. “When they were thinking about what to do, the head of the Polish air force came into the cockpit and said, ‘We are landing’ and overruled the two pilots because he is higher up in the hierarchy. Wolff explained that delegating key roles to key staff, thereby empowering them to exercise their strengths, is what has made his team such a formidable foe for its rivals. “In qualifying and the race James [Vowles, Mercedes chief strategist] flies the aeroplane,” he continued. “What I can do is give him feedback and input, but ultimately it is his decision what to do. That ethos extends beyond the pit wall on race weekends and into the factory more generally — and certainly into the cockpit, where Lewis Hamilton and Valtteri Bottas have been able to work without friction to push the team in a unified direction. If the secret is teamwork, concerning to the neutral fan is that Mercedes is liable to get only stronger with time as internal bonds become only more steadfast. “There is no silver bullet; I think you need to combine skills in order to achieve good performances,” Wolff said. “You have to have experience in the team that has seen similar situations and you have to have the youth that approach things without any boundaries, allowing innovation, providing a safe environment and the right mindset. It’s a magic mix that Mercedes has mastered, and it suggests there’ll be no slowing down for the team that is surely modern F1’s best. Food for thought for any team brave enough to try to take on the Silver Arrows.